CertainTeed Shingles | Roof Replacement specialist In South Etobicoke, Mississauga, Oakville, Burlington, Milton. Most Manufactures take both price and quality into consideration in the design and manufacture of their products. But when excellence is the top priority, the product line reflects it. Of course, higher quality may cost a bit more. That higher price from the manufacture forces the contractor to face the same choice of priorities. If he chooses the higher quality path, he must pay more. And now he must somehow convince the homeowner of the higher value of his pass-through price. Roofs on Homes chooses to spend the extra bucks for excellence. We are now faced with task of convincing our homeowners that we made the right decision: a decision that’s right not only for us but also for you, your home deserves Quality. CertainTeed manufactures high quality shingles by optimizing the performance characteristics of the blended components-using specially formulated fiber glass mat, asphalt, stabilizers, granules and asphalt. Certain Teed designs and specifies component materials used in manufacturing shingles so that they combine together to create a superior finished product with characteristics better than the sum of its parts. Recent proprietary technological advances in fiber glass mat chemical and physical properties, along with CertainTeed’s carefully designed and selected component materials, have resulted in improved product performance ensuring compliance of its shingles to CertainTeed’s stringent performance and code requirements. 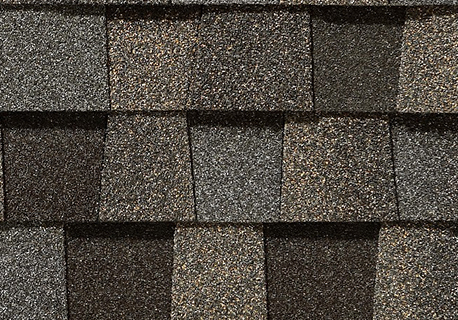 In short, CertainTeed designs and manufactures shingles to meet very strict specifications. One of the most important requirements is the requirement for tear strength. The minimum allowable tear strength to meet the tough requirements of ASTM D3462 is 1,700 grams of force on the Elmendorf pendulum tear tester. All CertainTeed fiber glass shingles are tested and certified by Underwriters Laboratories to meet the ASTM D3462 standards – and we can prove it. When you see a UL, label certifying compliance to ASTM D3462 on a bundle of CertainTeed fiber glass shingles, you can have confidence that they meet this tough standard. Copies of CertainTeed’s UL Certificate of Compliance are available on their website (www.certainteed.com). For more information call 1-800-233-8990. Each raw material must be tested carefully to insure performance of a properly manufactured shingle. CertainTeed works closely with each raw material supplier to develop specifications that ensure top quality and consistency, from day to day, week to week and year to year. Raw material testing takes place at three levels. First, potential raw materials are screened by R&D to determine if they will preform to produce a product that matches the demand of the marketplace. Second, these raw materials are tested during the supplier selection process for compliance with CertainTeed performance criteria. Finally, they are evaluated when they’re delivered to the plant to assure that each batch meets CertainTeed requirements.